Enhance the animal shelter theme in your backyard by adding this Bird In Hand Red Summitville Stable Bird House to it. This tall domicile creates a perfect roosting spot for your feathered friends, while its reclaimed wood construction lends an environmentally sound hint to the piece. The aged red finish contrasts the white accents on the home, and a pitched, metal roof protects the generous interior from the elements. A black, plastic horse silhouette rests above the 1.25" diameter entry hole, and a plastic door outline sits beneath the entry to further evoke a barn or stable. A picket fence accent extends from one side of the door frame and along one side of the shelter, and its white color contrasts the distressed red finish on the home. The aged metal roof overhangs the entry, keeping rain out of the unit, and a drainage hole on the base allows any captured water to exit. A 2" diameter opening on the back of the item enables you to seasonally clean it, and a top wire makes it simple to hang. Attach a mounting bracket (not included) to the base of the abode to place it on a pole or post. The reclaimed wooden body is sure to bring antique charm to your garden, while repurposing materials for the benefit of the environment. 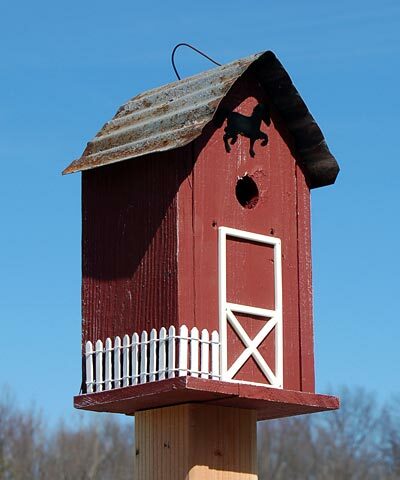 Add a unique shelter to your bird garden with this Red Summitville Stable Bird House. Made in the USA.